The Good Soldier Svejk is an enjoyable satire looking at the beaurocracy of WW1. I loved the little sketches throughout the book that helped to illustrate the story and bring the characters to life. 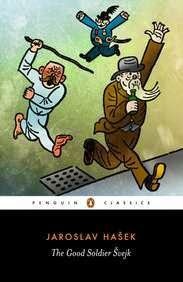 My only complaint of this book is that it is fairly long and at times feels a little repetitive as we see Svejk get into similar situations again and again. But it is still witty and clever and well worth reading.